These stamps are excellent for Special Education. The set reinforces visual discrimination skills. 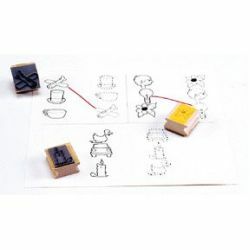 Both the fragmented images and total images are provided in the set and can be used for tracing, matching, teaching vocabulary and a variety of other activities. Set #810 can be used in conjunction with Sets #811 and #812 which are progressively more difficult. Set 810 is shown. Set 811 & 812 not shown.